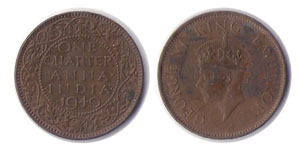 East India Company coins, 1835 One Quarter Anna coin, 1862 One Quarter Anna coin, 1897 One Quarter Anna coin, 1907 One Quarter Anna coin, 1910 One Quarter Anna coin, 1918 One Quarter Anna coin, 1919 One Quarter Anna coin, 1936 One Quarter Anna coin, 1940 One Quarter Anna coin,Rice pulling coins, Rare Indian coins, ujjala liquid coins. Year-wise or ascending ordered One quarter anna coins. 1835 One Quarter Anna coin. East India Company One Quarter Anna Coin. 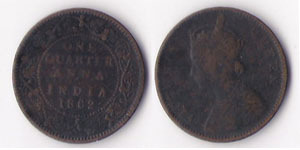 1862 One Quarter Anna coin. 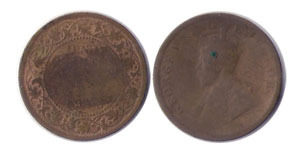 Victoria Empress One Quarter Anna Coin. 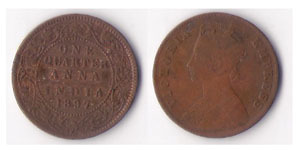 1897 One Quarter Anna coin. 1907 One Quarter Anna coin. 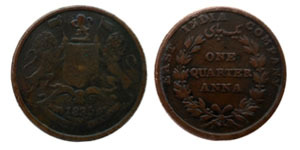 Edward VII King & Emperor One Quarter Anna Coin. 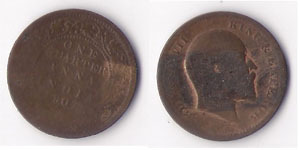 1910 One Quarter Anna coin. 1918 One Quarter Anna coin. George V King Emperor One Quarter Anna Coin. 1919 One Quarter Anna coin. 1936 One Quarter Anna coin. 1940 One Quarter Anna coin. George VI King Emperor One Quarter Anna Coin.